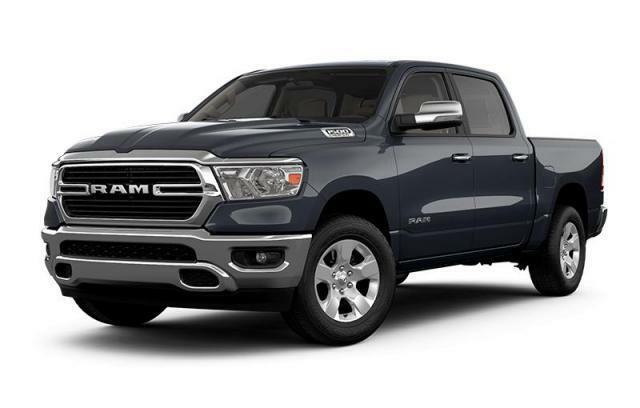 This Ram 1500 boasts a Regular Unleaded V-8 5.7 L/345 engine powering this Automatic transmission. WHEELS: 20" X 9" CHROME-CLAD ALUMINUM (WRK), TRANSMISSION: 8-SPEED AUTOMATIC, TIRES: 275/55R20 ALL-SEASON LRR. QUICK ORDER PACKAGE 25X BIG HORN -inc: Engine: 5.7L HEMI VVT V8 w/FuelSaver MDS, Transmission: 8-Speed Automatic , SIRIUSXM SATELLITE RADIO -inc: For SiriusXM Info Call 800-643-2112, 1-Year SiriusXM Subscription, SINGLE-DISC REMOTE CD PLAYER, REMOTE START SYSTEM, REAR WHEELHOUSE LINERS, RADIO: UCONNECT 4 W/8.4" DISPLAY, MAXIMUM STEEL METALLIC, GVWR: 3,220 KGS (7,100 LBS), ENGINE: 5.7L HEMI VVT V8 W/FUELSAVER MDS -inc: Hemi Badge, Bright Dual Rear Exhaust Tips, GVWR: 3,220 kgs (7,100 lbs), 180-Amp Alternator, Heavy-Duty Engine Cooling, Active Noise Control System, DIESEL GREY/BLACK, CLOTH FRONT 40/20/40 SPLIT BENCH.